to hold Intimate Wedding Ceremonies and Glorious Honeymoons. The Event Lady of Florida features one of her favorite private islands,"Private Islands of Georgia" as seen thru her own camera len's and shared in this video slide show below, based on her own personal experience on Eagle Island as a guest of Leigh Cort Publicity and Captain Andy Hill the island's proud owner. 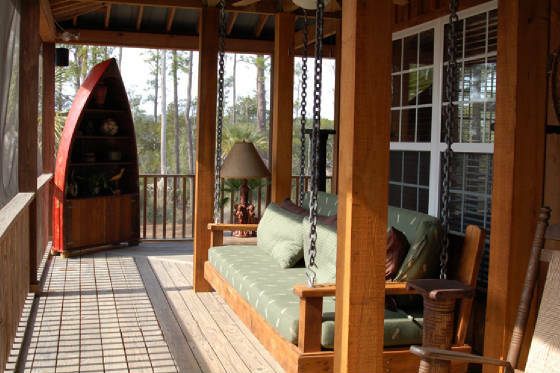 This is a wonderful vacation spot in a comfortable, ample and beautiful lodge located in Coastal Georgia, truly a perfect wedding destination or a very private and romantic honeymoon location. Can you imagine your very own island for a week or more? As a travel writer with a focus on special event destinations, her vacation trip is shared in a genuine and casual travel log. Please read the article at end of this page which was featured on her blog. Please Note: The Event lady can offer destination management services for these very intimate and unique wedding celebrations, anniversaries or special events in these secluded private locations. Can you See Yourself on this Swing? Read Full Blog Article on Private Islands of Georgia Click Here.